ABU DHABI (WAM) — Saudi Oil Minister Ali Ibrahim Al Naimi said on Oct.10, 2004 his country is well prepared to increase its production from 9 million barrels per day to 11 million. 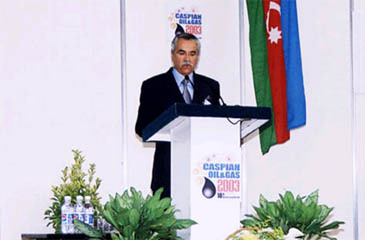 "Saudi Arabia will raise its output should the supply factor so requires and that it will not dump the market," Naimi told reporters at the venue of the Abu Dhabi International Petroleum Exhibition and Conference, ADIPEC 2004, which kicked off on Oct.10, 2004. He said most of the global demand is for light crude and that his country will incr ease its capacity of light crude in the near future. In the meantime, the UAE will increase production capacity by nearly 300,000 barrels per day in the near future and has plans to increase its overall capacity from the present 2.5 million bpd to 3.5 million bpd by 2006, Minister for Petroleum and Energy Obaid bin saif AI Nassiri told reporters at ADIPEC 2004..
Nasseri said the UAE move was in a bid to cool down the oil market, hit by skyrocketing prices in recent months, Kuwait's Minister of Oil Ahmed AI Fahad AI Sabah also told reporters that Kuwait will increase capacity in the short feme by 200,000 bpd. The Gulf state is currently Produces 2.5 million battels per day. "I accept the high prices because it is determined by political developments, but OPEC will! work towards bringing about stabi lity in the market, he said. Meanwhile, Saudi Arabia's Minister for Petroleum, Ali Ibrahim Al Naimi said that in view of the fact that most of the global demand is for light crude, Saudi Arabia will increase its capacity of light crude in the near future.